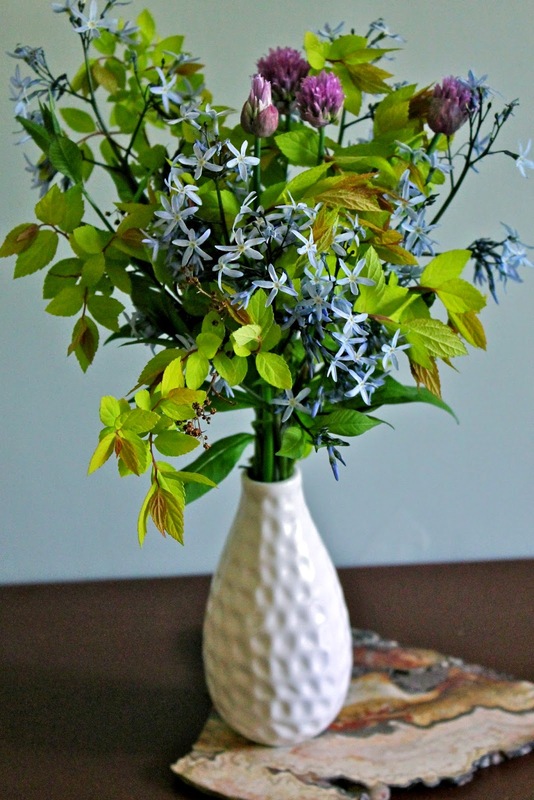 of the year, maybe the decade, had three elements; chive flowers just beginning to open, blue star amsonia (Amsonia tabernaemontana) in that ethereal color so hard to find in a garden, and chartreuse new foliage of spirea. The trio came from daughter Jen's garden in Canterbury NH, and welcomed us to the guest room on our Memorial Day sleep-over. All are stuffed casually in a bud vase from the swap shed at the town dump. The amsonia grows casually in Jen's garden, befitting a native wildflower. I've never grown it, but now I have to. On sale from many sites on line. Start of the "stuff it in a vase" season. It's hard to go wrong. Welcome to New Hampshire! Amsonia's truly great;mine's blooming for the first time this year, it should be used more often! How much sun does it need? Usually listed as full sun or part shade. Known in fall for gorgeous golden foliage.